Interview with Boketto Wellness & Introduction to SunRoot Solar Serum. February 2019. Read more HERE. Interview with Golubka Kitchen. January 2019. Read more HERE. Golden Hour Body Oil featured in The Zoe Report. December 2018. Read more HERE. Interview with Inner Light. May 2018. Read more HERE. Golden Hour Body Oil featured for CR Fashion Book online. April 2018. Read more HERE. Interview for CAP Beauty's The Thinking CAP. January 2018. Read full interview HERE. 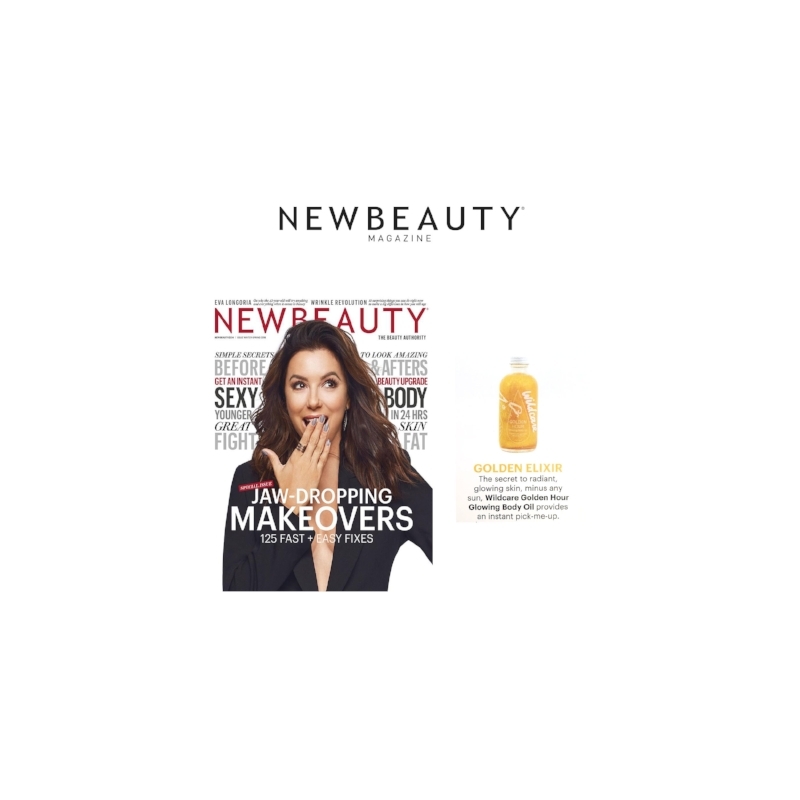 Golden Hour Body Oil featured in the December issue of New Beauty Magazine. Interview with founder Cortney Herrera, for Clever Los Angeles. December 2017. Click HERE to read. Golden Hour Body Oil as the first pick for Vogue. December 2017. Golden Hour Body Oil for Glamour. November 2017. Wildcare's Soft Focus Mask featured in the premiere issue of Goop Magazine! Purchase HERE. September 2017. Lee Tilghman shares her top beauty products, including Soft Focus Mask. Read more HERE. September 2017. Founders of CAP Beauty share their favorite LA products, including Golden Hour Body Oil. August 2017. Soft Focus Coconut Milk Mask featured on Fashionlush. August 2017. Ojai White Sage Hydrosol featured in Coveteur in this fun article by Jane Larkworthy. Read HERE. June 2017. Ojai White Sage featured on Byrdie. Read more HERE. May 2017. Featured in House of Citrine. Read more HERE. April 2017. Featured in Darling Magazine. Read more HERE. April 2017. Featured in Bustle. Read more HERE. March 2017. Featured in the NY Observer. Read more HERE. February 2017. Wildcare Skincare and The Power of Hydrosols / Interview with Jenni Kayne. February 2017. Sharing our top 1, 5, & 10 minute wellness tips with Good/Life. January 2017. Wildcare featured on Byrdie. Read more HERE. Shop Bee Rosy Mask HERE. December 2016. Western Red Cedar Hydrosol featured on Byrdie. Read more HERE. December 2016. Empress Cypress Hydrosol featured on Vogue.com. Read more HERE. December 2016. Golden Hour Body Oil in Womens Health Magazine. Read more HERE. December 2016. Featured in the Winter Issue of Santa Barbara Magazine. Find it in print or HERE to download. November 2016. We spoke with Nylon on how to naturally, best care for your skin during seasonal transitions. October 2016. Time Out LA's first printed magazine / Western Red Cedar Hydrosol featured on page 66. October 2016. Ojai White Sage Hydrosol in . September 2016. Soft Focus Coconut Milk Mask spotted on Mother. August 2016. Golden Hour Body Oil featured on Harper's Bazaar. July 2016. Purple Majesty Lavender Hydrosol featured in Artful Living Magazine's Summer Packing Guide. August 2016. Ojai White Sage Hydrosol featured on Byrdie.com. August 2016. 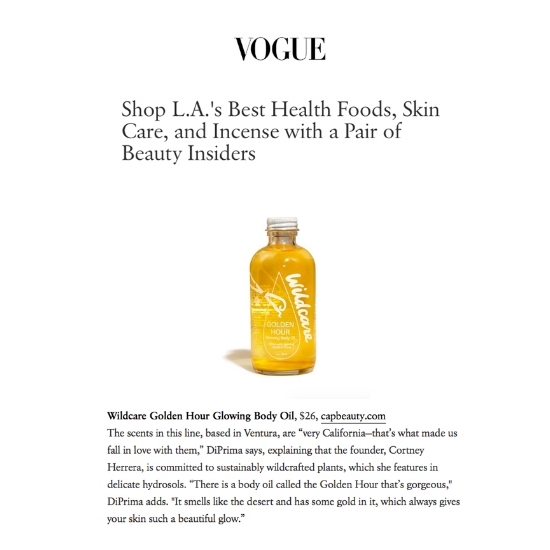 Ojai White Sage Hydrosol featured on Harper's Bazaar. June 2016. Hawaiian Sandalwood Hydrosol featured on Harper's Bazaar. May 2016. For press related inquiries, please contact us at hellowildcare@gmail.com using the subject "PRESS".